His Antagonism to the Ḥasidim. Lithuanian Talmudist, cabalist, grammarian, and mathematician; born at Wilna April 23, 1720; died there Oct. 9, 1797. He gave evidence of the possession of extraordinary talents while still a child. At the age of seven he was taught Talmud by Moses Margalit, rabbi of Kaidan and the author of a commentary to the Jerusalem Talmud, and was supposed to know several of the treatises by heart. From the age of ten he continued his studies without the aid of a teacher. When he reached a more mature age Elijah wandered in various parts of Poland and Germany, as was the custom of the Talmudists of the time. He returned to his native town in 1748, having even then acquired considerable renown; for when he was hardly twenty years old many rabbis submitted their halakic difficulties to him for decision. Since Elijah had never studied at any yeshibah, he had this advantage, that his mind was never biased by prejudice or by the perverted methods of study then in vogue. He thus escaped casuistry, his mind remaining open to the plain and simple peshaṭ. Elijah's chief merit consisted in this fact, that he applied to the Talmud and the cognate literature proper philological methods. He even made an attempt toward a critical examination of the text; and thus, very often with a single reference to a parallel passage, or with a textual emendation, he overthrew all the castles in the air erected by his predecessors. 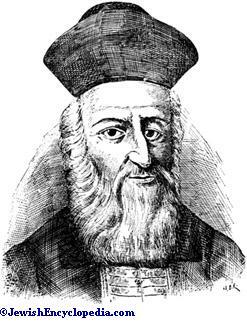 But, besides the two Talmuds and the other branches of rabbinic literature which he had very soon committed to memory, he devoted much time to the study of the Bible and Hebrew grammar, as well as to the secular sciences, enriching the latter by his original contributions. His pupils and friends had to pursue the same plain and simple methods of study that he followed. He also exhorted them not to neglect the secular sciences, maintaining that Judaism could only gain by studying them. Elijah was also attracted to the study of the Cabala; but from his controversy with the Ḥasidim it would seem that he was not prepared to follow the mystics to the full extent of their teachings. Elijah was very modest and disinterested; and he declined to accept the office of rabbi, though it was often offered to him on the most flattering terms. In his later years he also refused to give approbations, though this was the privilege of great rabbis; he thought too humbly of himself to assume such authority. He led a retired life, only lecturing from time to time to a few chosen pupils. But in spite of his desire to avoid publicity his fame was soon widely spread, and in 1755, when Elijah was only thirty-five, Jonathan Eybeschütz, then sixty-five years old, applied to Elijah for an examination of and decision concerning his amulets, which were a subject of discord between himself and Jacob Emden. Elijah, in a letter to Eybeschütz, stated that, while in full sympathy with him, he did not believe that words coming from a stranger like himself, who had not even the advantage of old age, would be of any weight with the contending parties. The only occasion upon which Elijah threw off his reserve and made his authority felt was the appearance of the Ḥasidim on the stage of Jewish history. When the latter became more audacious, and even began to make proselytes in his native town, which had always remained proof against all kinds of innovation, Elijah, joining the rabbis and heads ofthe Polish communities, took the necessary steps to check the Ḥasidic influence. In 1777 the first excommunication was launched at Wilna against the Ḥasidim, while a letter was also addressed to all the large communities, exhorting them to deal with the Ḥasidim after the example of Wilna, and to watch them until they had recanted. The letter was acted upon by several communities; and in Brody, during the fair, the excommunication was pronounced against the Ḥasidim. In 1781, when the Ḥasidim renewed their proselytizing work under the leadership of their rabbi, Shneor Salman of Liadi, Elijah excommunicated them again, declaring them to be heretics with whom no pious Jew might intermarry. Elijah also accused Shneor Salman and his adherents of having accepted a pantheistic system. After this, Elijah went into retirement again, and the Ḥasidim seized the opportunity to spread a rumor that Elijah sided with them and that he repented of having persecuted them. 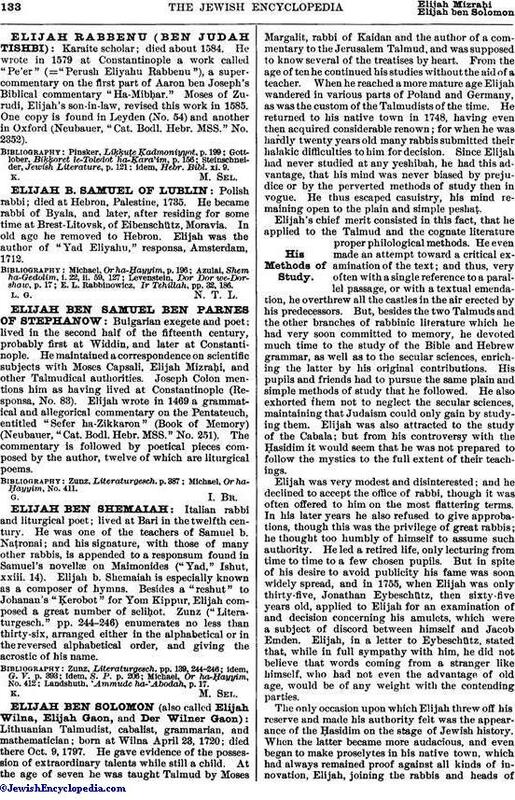 Elijah then sent two of his pupils (1796) with letters to all the communities of Poland, declaring that he had not changed his attitude in the matter, and that the assertions of the Ḥasidim were pure inventions. Still, Elijah had seen beforehand that all the excommunications would be of no avail, and that they would not stop the tide of Ḥasidism. Except in this instance, Elijah never took part in public affairs; and, so far as is known, he did not preside over any great school in Wilna. He was satisfied, as has been already stated, with lecturing in his bet ha-midrash to a few chosen pupils, whom he initiated into his scientific methods. He taught them Hebrew grammar, Bible, and Mishinah—subjects which were largely neglected by the Talmudists of that time. He was especially anxious to introduce them to the study of the pre-Talmudic literature—the Sifra, Sifre, Mekilta, Tosefta, Seder 'Olam, and the minor treatises—which were very little known by the scholars of his time. 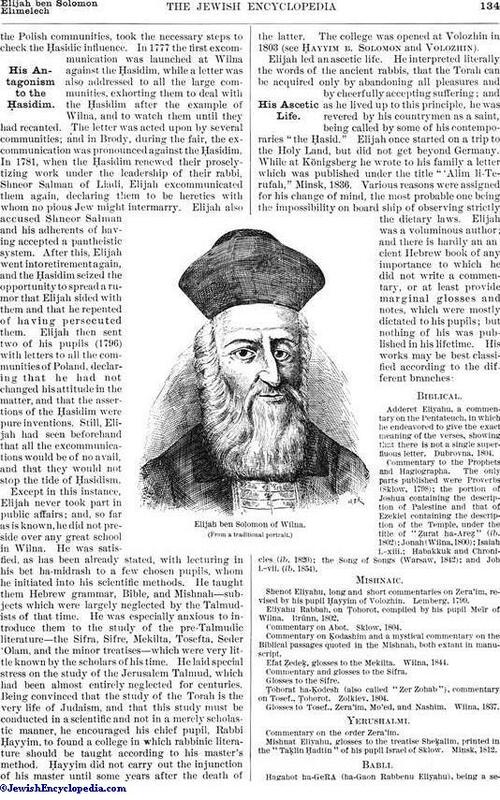 He laid special stress on the study of the Jerusalem Talmud, which had been almost entirely neglected for centuries. Being convinced that the study of the Torah is the very life of Judaism, and that this study must be conducted in a scientific and not in a merely scholastic manner, he encouraged his chief pupil, Rabbi Ḥayyim, to found a college in which rabbinic literature should be taught according to his master's method. ḥayyim did not carry out the injunction of his master until some years after the death of the latter. The college was opened at Volozhin in 1803 (see Ḥayyim b. Solomon and Volozhin). Adderet Eliyahu, a commentary on the Pentateuch, in which he endeavored to give the exact meaning of the verses, showing that there is not a single superfluous letter. Dubrovna, 1804. Commentary to the Prophets and Hagiographa. The only parts published were Proverbs (Sklow, 1798); the portion of Joshua containing the description of Palestine and that of Ezekiel containing the description of the Temple, under the title of "Ẓurat ha-Areẓ" (ib. 1802); Jonah (Wilna, 1800); Isaiah i.-xiii. ; Habakkuk and Chronieles (ib. 1820); the Song of Songs (Warsaw, 1842); and Job i.-vii. (ib. 1854). Elijah ben Solomon of Wilna. Shenot Eliyahu, long and short commentaries on Zera'im, revised by his pupil Ḥayyim of Volozhin. Lemberg, 1799. Eliyahu Rabbah, on Ṭohorot, compiled by his pupil Meïr of Wilna. Brünn, 1802. Commentary on Abot. Sklow, 1804. Commentary on Ḳodashim and a mystical commentary on the Biblical passages quoted in the Mishnah, both extant in manuscript. Efat Ẓedeḳ, glosses to the Mekilta. Wilna, 1844. Commentary and glosses to the Sifra. Ṭohorat ha-Ḳodesh (also called "Zer Zohab"), commentary on Tosef., Ṭohorot. Zolkiev, 1804. Glosses to Tosef., Zera'im, Mo'ed, and Nashim. Wilna, 1837. Commentary on the order Zera'im. Mishnat Eliyahu, glosses to the treatise Sheḳalim, printed in the "Taḳlin Ḥadtin" of his pupil Israel of Sklow. Minsk, 1812. 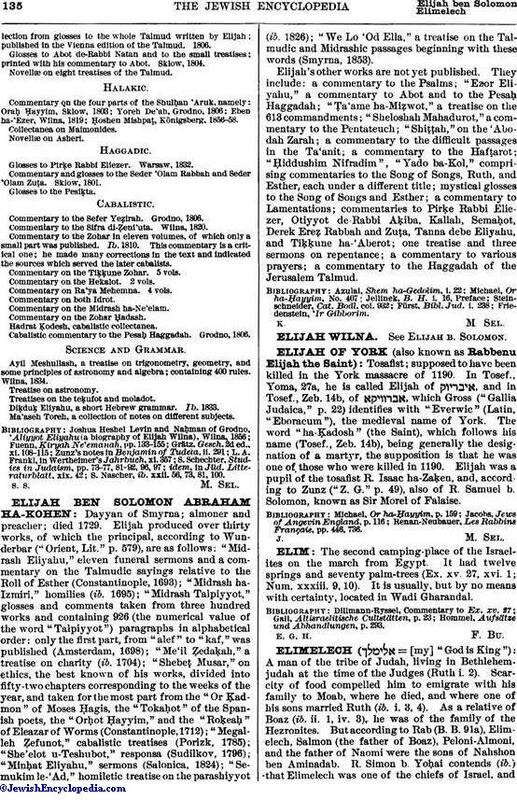 Hagahot ha-GeRA (ha-Gaon Rabbenu Eliyahu), being a selectionfrom glosses to the whole Talmud written by Elijah; published in the Vienna edition of the Talmud. 1806. Glosses to Abot de-Rabbi Natan and to the small treatises; printed with his commentary to Abot. Sklow, 1804. Novellæ on eight treatises of the Talmud. Commentary on the four parts of the Shulḥan 'Aruk, namely: Oraḥ Ḥayyim, Sklow, 1803; Yoreh De'ah, Grodno, 1806; Eben ha-'Ezer, Wilna, 1819; Ḥoshen Mishpaṭ, Königsberg, 1856-58. Glosses to Pirḳe Rabbi Eliezer. Warsaw, 1832. Commentary and glosses to the Seder 'Olam Rabbah and Seder Olam Zuṭa. Sklow, 1801. Commentary to the Sefer Yeẓirah. Grodno, 1806. Commentary to the Sifra di-Ẓeni'uta. Wilna, 1820. Commentary to the Zohar in eleven volumes, of which only a small part was published. Ib. 1810. This commentary is a critical one; he made many corrections in the text and indicated the sources which served the later cabalists. Commentary on the Tiḳḳune Zohar. 5 vols. Commentary on the Hekalot. 2 vols. Commentary on Ra'ya Mehemna. 4 vols. Commentary on the Midrash ha-Ne'elam. Commentary on the Zohar Ḥadash. Cabalistic commentary to the Pesaḥ Haggadah. Grodno, 1806. Ayil Meshullash, a treatise on trigonometry, geometry, and some principles of astronomy and algebra; containing 400 rules. Wilna, 1834. Treatises on the teḳufot and moladot. Diḳduḳ Eliyahu, a short Hebrew grammar. Ib. 1833. Ma'aseh Toreh, a collection of notes on different subjects. S. Nascher, ib. xxii. 56, 73, 81, 100.